When cognitive demand increases, does the right ear have an advantage? A dichotic listening task presents two different sound sequences simultaneously to both ears. Performance on these tasks measures selective auditory attention for each ear, either binaural separation or binaural integration (see Figure 1 for examples). Based on the anatomical model of auditory processing, the right ear has a slight advantage, compared with the left ear, on dichotic listening tasks. This is due to left brain hemispheric dominance for language, which receives direct auditory input from the right ear (i.e., strong contralateral auditory pathway; Kimura, 1967). Clinical tests of auditory function quantify this right ear advantage for dichotic listening tasks to assess maturity of the auditory system, in addition to other clinical implications. Accurate performance on dichotic tests relies on both sensory organization and memory. As a child matures, the right ear advantage decreases until it is no longer clinically significant. However, clinically available dichotic-digits tests use only 1, 2, (e.g., Dichotic digits test; Musiek, 1983; Musiek, et al., 1991) or 3 (i.e., Dichotic Digits–MAPA; Schow, Seikel, Brockett, & Whitaker, 2007) digit sets in each ear for testing. See Figure 1 for maximum task demands of clinical tests for binaural integration, instructions “B”, using free recall protocol (Guenette, 2006). Daily listening often requires an adult to process competing information that extends six items of sensory input. This study investigated the impact of increasing cognitive demands on ear performance asymmetries (i.e., right versus left) in mature auditory systems. Forty-two participants (i.e., 19-28 year-olds) performed dichotic binaural separation tasks (adapted from the Dspan Task; Nagaraj, 2017), for 2, 3, 4, 5, 6, 7, 8, and 9-digit lists. Listeners recalled the sequence presented to one ear while ignoring the sequence presented to the opposite ear (i.e., binaural separation; directed ear protocol). 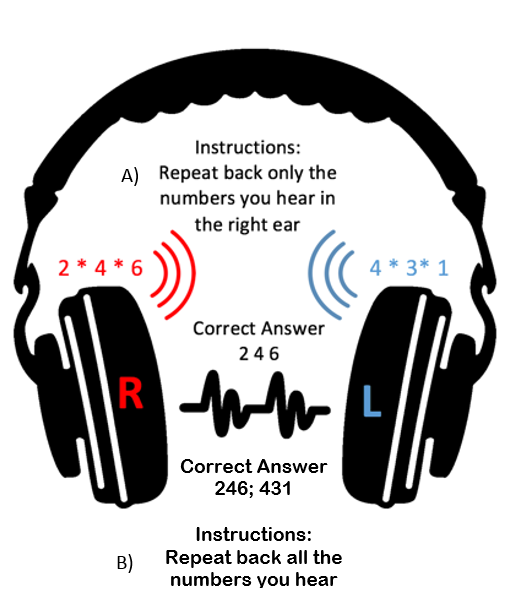 See Figure 1 for an example of the experimental binaural separation tasks (i.e., digit length = 3 used for condition 2) and instructions “A” for directed ear recall. Results in Figure 2 show a significant effect for directed ear performance as task demands increase (i.e., digit list length). 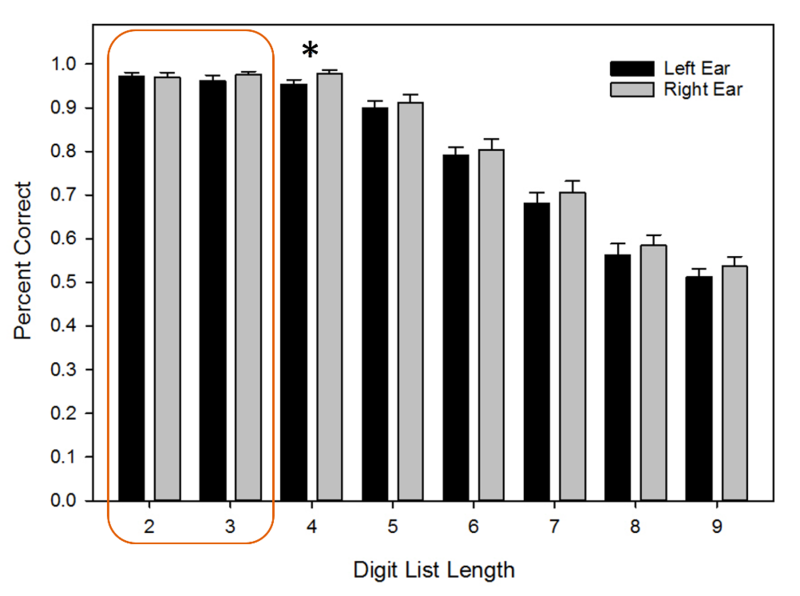 The overall evaluation of the list length (Figure 2) does not reveal the impact of working memory capacity limits (i.e., maximum items that can be recalled for an ongoing task) for each participant. Therefore, a digit span was measured to estimate each participant’s simple working memory capacity. 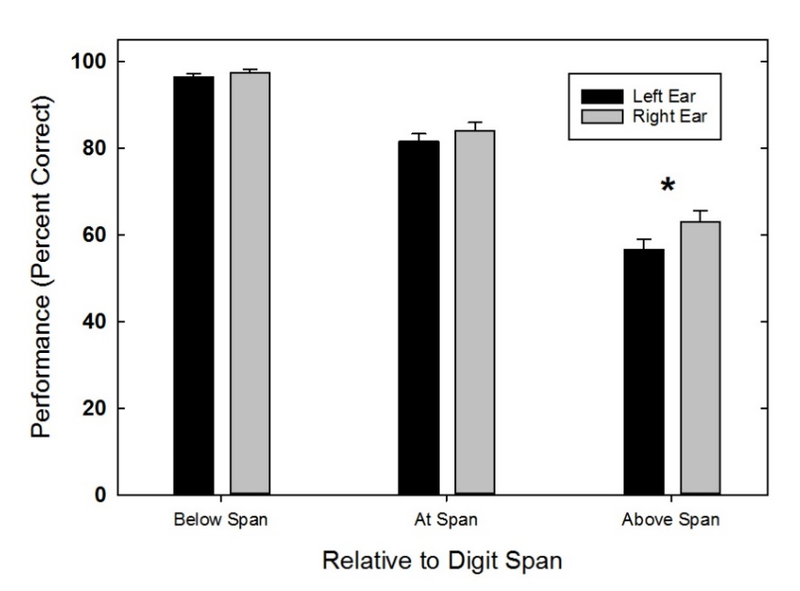 Planned comparisons for ear performance relative to a participant’s digit span (i.e., below = n-2, at span = n, and above span = n+2 digit lists, where n = digit span) evaluated the role of cognitive demand on ear asymmetries. Planned t-test comparisons revealed a significant performance asymmetry above span (i.e., n+2). No significant differences were identified for performance relative to, or below, an individual’s simple memory capacity. This indicates the persistence of the right ear advantage in mature auditory systems when listening demands exceeded an individual’s auditory memory capacity. Overall, the study found the right ear continues to show better performance on dichotic listening tasks, even in mature adults. This persistent right ear advantage occurred when the number of digits in the sequence exceeded the participants’ digit span capacity. We believe such demands are a realistic aspect of every day listening, as individuals attempt to retain sensory information in demanding listening environments. These results may help us modify existing clinical tests, or develop a new task, to more precisely reveal performance asymmetries based on an individual’s auditory working memory capacity. Figure 1. Displays an example of dichotic digit stimuli presentation, with both “A” binaural separation tasks (i.e., directed ear) and “B” binaural integration (i.e., free recall) instructions. Figure 2. Displays ear performance on the binaural separation task across all participants. Note: the orange box highlights the maximum demands of commercially available dichotic-digits tests; participant performance reflects a lack of asymmetry under these cognitive demands. Figure 3. Displays participant ear performance on the binaural separation task relative to digit span. Kimura, D. (1967). Functional asymmetry of the brain in dichotic listening. Cortex, 3(2), 163- 176. Musiek, F., (1983). Assessment of central auditory dysfunction: The dichotic digit test revisited. Ear and Hearing, 4(2), 79-83. Musiek, F., Gollegly, K., Kibbe, K., & Verkest-Lenz, S. (1991). Proposed screening test for central auditory disorders: Follow-up on the dichotic digits test. The AmericanJournal of Otology, 12:2, 109-113. Guenette, L.A. (2006). How to administer the Dichotic Digit Test. The Hearing Journal, 59 (2), 50. Nagaraj, N. K. (2017). Working Memory and Speech Comprehension in Older Adults with Hearing Impairment. Journal of Speech Language and Hearing Research, 60(10), 2949-2964. doi: 10.1044/2017_JSLHR-H-17-0022.